The black currant plant thrives well in fertile, well drained, and slightly acidic soil. In order to maintain a healthy black currant shrub and harvest good quality fruits, grow it in a sunlit location. Here is more information on black currant planting and care. Black currant plant, also spelled as blackcurrant, is a cold, hardy shrub. Scientifically represented as Ribes nigrum, it belongs to the Grossulariaceae family. This plant has palmately lobed leaves and reddish green flowers borne in a long, raceme inflorescence. This perennial plant is known for its dark purple colored edible berries. 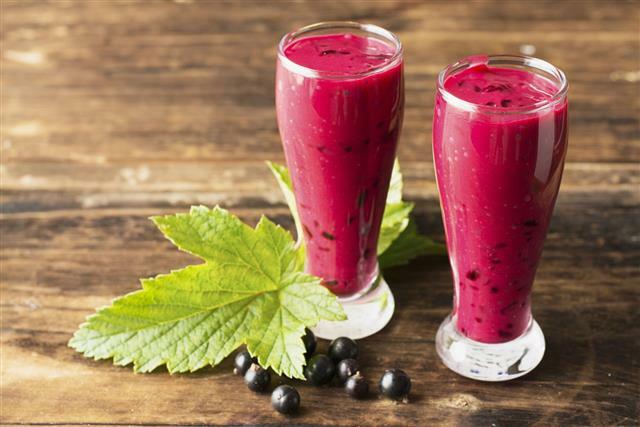 Black currant juice, which is tangy to taste, is very popular among people. Also, the seeds of this fruit are loaded with innumerable health benefits. Black currant shrubs grow well in sunny and less crowded sites. In case of shaded yards, select a partial shade region that receives sunlight for at least a few hours everyday. Since this hardy shrub has a longer life period, proper soil preparation is of utmost importance for growing it. For maintaining healthy plants, the soil should be rich, well-drained, and in a near normal to slightly acidic (pH 6.5-7.5) range. Prior to planting, dig a large hole and add a heavy dose of bone meal or farmyard compost to it. Let the soil set for a couple of weeks. At the time of plantation, make a hole slightly deeper (about 5 cm) than it was in the pot. Gently place the plant and fill the hole with soil. Press the soil firmly around the stem to remove any air pockets. Repeat these steps for growing other plantlets, but make sure to leave a space of about 1.8 meters between two plants. Water the newly planted shrub deeply. After-planting care involves providing a warm temperature, moderate watering, and adequate nutrients. A one inch watering per week is sufficient to maintain the shrub. Laying a thick layer of organic mulch is beneficial in terms of conserving soil moisture and controlling weed growth. When exposed to prolonged dry spells, this plant is susceptible to mildew. Similar to maintenance of other shrubs and bushes, pruning is a basic step in caring for a black currant plant. For a well established shrub, consider removing one-third of the old stems, and the weak and dead twigs. Mark the branches to be pruned and cut them very close to the main stem. By pruning this way, you can succeed in controlling diseases and pests to some extent. Look out for pest and disease infestations in the plants. Common pests that affect these plants are gall mite, aphids, and spider mites, whereas diseases include mildew, blister rust, reversion virus, and leaf spotting disease. According to cultivators, disease attacks are directly proportional to increase in the percentage of nitrogen content in soil. Hence, ensure that you use correct fertilizers in appropriate concentration. If you have a black currant plant at home, you can propagate new plantlets on your own. The only consideration in collecting plant cuttings is doing so at the appropriate time, which is around mid October. As the plant is in a dormant state, it can recover fully after the cuttings are made. With correct care and maintenance, this plant can remain productive for more than 15 years. However, the fruit quality and yield decrease gradually with age.